Don’t Miss the YMCA Birthday Bash of the Year! Have you heard the exciting news? We’re hosting a huge birthday party for our Northwest YMCA! The party is FREE and open to the public—that’s right, you don’t have to be a Y member to join us in the celebration! There will be a variety of snacks and treats, including cake and popcorn, as well as a hot dog cookout. We’ll have giveaways throughout the evening, with prizes such as water bottles, sunglasses, fidget spinners, and Parent’s Night Out certificates! Carnival games and putt putt will be open for play in our gym, and we’ll even have games in our pool that your kids can participate in, along with open swim! Before the birthday bash begins, we’ll have an Open House at the Northwest location from 8:00 am-4:00 pm. Stop by with a friend and enjoy FREE guest passes all day long. Plus, if you sign up for a Monroe County Y membership at the Northwest facility, your Joiner Fee will only be $5! That could save you up to $95! If you’d like to tour the facility along with our newly renovated Annex during the day with no distractions, our Play and Learn (6 weeks-6 years) and The Zone (ages 7-12) areas will be open from 9:00 am-1:00 pm. Your kids can play and make new friends while you learn about the Northwest location! We cannot wait to throw this huge celebration! Bring your friends and family along for a night of food and fun; it’s going to be a blast for everyone. We’re ecstatic for you and the rest of our Monroe County community to enjoy the new amenities that our Northwest location will offer. *Free guest passes and the $5 Joiner Fee only apply at the Northwest YMCA on Saturday, November 3. These rates will not be available at the Southeast YMCA location. Categories: News, Uncategorized | Permalink. If you, your family, or anyone else you know has been looking for the perfect time to sign up for a YMCA membership, now is the time! From September 15 through September 30, we’re waiving our Joiner Fee, which means you could save up to $100 when you sign up. When you become a member at the Y, you sign up for so much more than just a gym. While we do have two fantastic facilities where you can lift weights, utilize a variety of cardio machines, play basketball alone or with friends, take a dip in either of our two heated pools, get your laps in on our indoor track, AND participate in over 30 Group Exercise classes that are included in your membership, we also provide several other amazing programs that can increase your overall health and ultimately make your life that much easier. If you’re a parent with little ones at home, you’ll be thrilled to know that we offer a variety of child care programs. One of these free programs is Play and Learn, which is included in our Family Membership. We’ll watch your 6-week-old to 6-year-old kiddos (and make sure they’re having a blast!) while you take some time for yourself and get your workout in. We also offer Preschool for little ones aged 21 months to 5 years. While the cost of Preschool isn’t included in our Family Membership, we offer the program at a special rate for all Y members. With this benefit, you can save up to $70! If you find that the member price is still out of your budget, we understand—that’s why we offer Financial Assistance for those who need it. Parents with older kids, we’re here to support you too! Our teen program, The Zone, offers a space for kids aged 7-12 to hang out with friends and play a variety of physical and electronic games—we have table tennis, video games, board games, LEGOs, and more! As a member, you also receive a special rate for every single program offered by the Y. Youth and Adult Sports, Swimming Lessons, Lifeguard Training, Personal Training sessions, Yoga classes, Summer Camp—you name it, you get a discount. The Y is here for you. Darla Brown, a member of ours, was asked how the Y has helped her to accomplish her fitness goals. She answered that through Personal Training, she is held accountable for her workouts, she is able to keep her weight where she wants it to be, she has become stronger and seen her body re-shape itself, she has more energy and confidence, and she has realized that she can “do it.” Your health goals become your reality at the Y. If you’re not already a Y member, we would absolutely love to have you join our community. Our goal is to help build a healthier Monroe County. We work with our neighbors, friends, and family to make sure everyone has an opportunity to grow and thrive, regardless of age, gender, race, religion, sexual orientation, and any other background that you may come from. Everyone belongs at the Y. When you become a member, you unlock a future full of possibilities for yourself and those closest to you. Stop by and see us from September 15 through September 30 to take advantage of this special membership price. We’d be more than happy to help you register at our Welcome Center in either branch of the Monroe County YMCA, or if you can’t make it in, you can register online or call us at (812) 332-5555. We can’t wait to see you soon! At the Y, we sometimes like to partake in a little friendly competition. In fact, we like it so much that we have other businesses and organizations come join us for a fun program called Corporate Challenge, which runs from the end of August through the beginning of October each year. If you follow the Monroe County YMCA on any of our social media accounts (if you don’t yet, you definitely should 😉), you’ve probably been seeing quite a lot of information about Corporate Challenge. If you’re not entirely sure what the event is or how it helps the Monroe County community, we’re here to explain! There are many, many awesome benefits of Corporate Challenge, but the most significant is that participants support the Y for All campaign when they compete in the 25+ sporting events that make up Corporate Challenge. Wondering what the Y for All campaign is? The campaign funds the Y’s mission to strengthen the foundations of our community by providing financial assistance to those who may not be able to afford a Y membership on their own. From summer camp to early childhood learning, the Y for All campaign allows those in need to enjoy the programs that are offered by the Y when they otherwise may not be able to afford or attend them. So how exactly does Corporate Challenge raise money for and awareness of the Y for All campaign? During the program, participants pay a small sum to compete in each event, and at the end of the month-and-a-half-long challenge, the proceeds are put toward helping children, families, and seniors become members of the Y, which enhances their overall health and well-being. Corporate Challenge is not only an amazing fundraising cause, but also a great bonding experience for the corporate teams involved. Through the event, a deeper community spirit is developed by the teams, overall company moral is boosted, and employee health and fitness is improved. Plus, Corporate Challenge is a great way for the Monroe County community as a whole to come together; it allows us to build and strengthen our connections with one another through fun sporting events and a common cause. The companies that participate in Corporate Challenge are competing against one another–in the name of good, old-fashioned fun, of course–and this allows team members within all companies to mingle, foster friendships, and ultimately work together to raise money for a fantastic cause. If you think your company would have a blast participating in this fun-filled cause, we’re always looking to grow our Corporate Challenge community! We also welcome volunteers with open arms, so if you are personally interested in getting involved, we’d love to have you. For more on Corporate Challenge, there’s a wealth of information about the event on our website. For more behind-the-scenes information–what it’s like to compete in the events, which businesses and organizations are leading on the scoreboard, and more–we keep everyone up-to-speed on our Facebook, Twitter, and Instagram pages. If Corporate Challenge doesn’t sound like your cup of tea, but you still want to donate to the Y for All campaign, we’d absolutely love to have you support our cause in any way that you can. You can Give Now online and learn more about what your donation truly means to members of the community, or you can stop by either Branch of the Monroe County YMCA at any time to make a donation in person. Stay tuned for more on this year’s Corporate Challenge, and thank you for being part of our community by supporting the Y for All. Did you know, 415 million people worldwide are estimated to have diabetes. The good news is, the Y is one of the largest providers for Diabetes Prevention programs for those with prediabetes worldwide! Lifestyle changes such as eating healthier, increasing physical activity and losing a modest amount of weight can prevent or delay development of type 2 diabetes in those at high risk for the disease. With the YMCA’s Diabetes Prevention Program, you can work with others in a small group setting to learn how to adopt habits that will improve your overall health and well-being and reduce your risk. The program, which is led by a trained Lifestyle Coach in a classroom setting, is delivered over a 12-month period, beginning with 16 weekly sessions followed by eight monthly maintenance sessions. You’ve seen the banners. You’ve seen the yard signs. Maybe you’ve even seen the posts on Facebook and Twitter. But you still wonder, ‘Who is Zoe?’. With programs such as LEAP and Preschool, the YCCF and Youth Sports, children who come to the Y will leave with more than a new friend, a new skill, or a new work of art for the refrigerator. Children who leave the Y at the end of the day walk away with lifelong skills, such as: leadership, teamwork, listening, communication skills, and so much more! Here at the Y, we pride ourselves in the work we do with and for children. But we can’t do it all without your help and the help of the community. Your donations will help children participate in the programs he or she needs to prepare for the future. It will allow a child to step inside and YMCA, whereas they may have never been given that chance if it weren’t for you. We are pleased to honor Donisha Reed, an AmeriCorps volunteer who has served the Monroe County YMCA for the past seven months working with the Energize program. Energize is a program that brings healthy fitness, eating, and lifestyle education to classrooms across Monroe County in innovative and hands-on ways. Donisha has worked very hard to expand the Energize program by developing new programs and instructing our students with enthusiasm. She took the initiative to apply for a grant through the American Public Health Program at Indiana University – and she was successful! The funds from this grant will help purchase supplies and provide the students will some fun extra events. Donisha has a strong background in health issues and her talents were expanded to our Energize classes on a daily basis. She is completing her service to the Monroe County YMCA and has accepted a job in Wichita Falls, TX, as a Health Director for the Bill Bartley YMCA. Congratulations, Donisha! AmeriCorps engages more than 50,000 Americans each year to meet community needs in community education. The Monroe County YMCA has hosted an AmeriCorps member for the past seven years. Supervised by Nancy Wroblewski, our AmeriCorps volunteers have contributed a great deal to the Y, helping us expand our impact on the Monroe County community. Donisha is finishing her service at the Y by creating promotional materials for our Healthy Kids Day, which will occur April 12th. We wish Donisha the best of luck in her new YMCA adventure. She will serve our mission in an outstanding manner. AmeriCorps engages more than 75,000 men and women in intensive service each year at more than 15,000 locations including nonprofits, schools, public agencies, and community and faith-based groups across the country. AmeriCorps members help communities tackle pressing problems while mobilizing millions of volunteers for the organizations they serve. Members gain valuable professional, educational, and life benefits, and the experience has a lasting impact on the members and the communities they serve. AmeriCorps consists of three main programs: AmeriCorps State and National, whose members serve with national and local nonprofit and community groups; AmeriCorps VISTA, through which members serve full time fighting poverty; and AmeriCorps NCCC (National Civilian Community Corps), a team-based residential program for young adults 18-24 who carry out projects in public safety, the environment, youth development, and disaster relief and preparedness. Strengthening nonprofits: AmeriCorps members help faith-based and community groups expand services, build capacity, raise funds, develop new partnerships, and create innovative, sustainable programs. Encouraging competition and local control: AmeriCorps pushes funding and decision-making to the state and local level. Most grantees are chosen by bipartisan state commissions appointed by the governor. Advancing social innovation: AmeriCorps invests in entrepreneurial organizations that have been recognized for their innovative approaches to citizen problem-solving such as Teach for America, City Year, YouthBuild, JumpStart, Citizen Schools, and Experience Corps. Expanding educational opportunity: In exchange for a year of full-time service, AmeriCorps members earn a Segal AmeriCorps Education Award (equal to the maximum Pell Grant) that helps pay for college or pay back student loans. AmeriCorps members have earned more than $2.4 billion in these awards since 1994. Preparing the 21st Century Workforce: AmeriCorps is a pathway to economic opportunity that provides members with valuable skills specific to their service (construction, teaching, weatherization, etc.) as well as general skills of leadership and problem-solving that all employers are looking for. Creating future leaders: AmeriCorps members gain new and useful skills, advance their education, and become more connected to their communities. A longitudinal study has shown that AmeriCorps alumni are more likely to be civically engaged, to go into public service careers—such as teaching, public safety, social work, and military service—and to volunteer in their communities. Public private partnerships: AmeriCorps leverages substantial private investment—more than $480 million in non-CNCS funds each year from businesses, foundations, and other sources. AmeriCorps has cut costs and become more efficient by supporting more members with fewer federal dollars. Mobilizing volunteers: AmeriCorps is a powerful catalyst and force-multiplier for community volunteering. Last year AmeriCorps members recruited, trained, and supervised more than 4 million community volunteers for the organizations they serve. The Monroe County YMCA has been fortunate to be an Americorps host site for the past 6 years and has been given 5,400 hours of service by their outstanding members! Our current AmeriCorps member is Amanda McIntyre. Amanda came to us in September of 2012 and will complete her service in August. 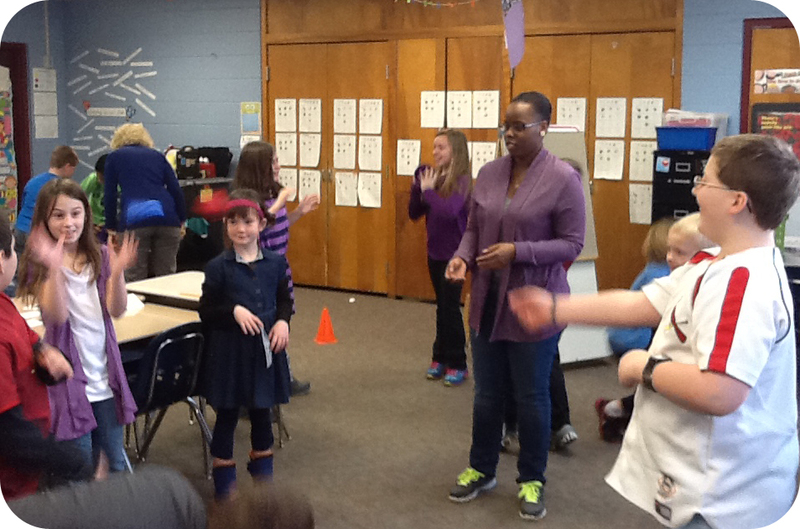 Amanda is currently working with our ENGERGIZE program, a childhood obesity prevention program we hold in MCCSC schools. Amanda, and all of the AmeriCorps volunteers before her, have made a real and last impact at the Monroe County YMCA! 800,000 Number of people who have served as AmeriCorps members since 1994. 1 billion Total number of hours served by AmeriCorps members since 1994. 5.2 million Number of disadvantaged youth tutored, mentored, or served by AmeriCorps members in fiscal 2011. 4 million Number of community volunteers managed or mobilized by AmeriCorps members in fiscal 2011. $480 million Value of cash and in-kind donations leveraged by AmeriCorps members in fiscal 2010. 15,000 Number of AmeriCorps service locations in 2012. $2.4 billion Total amount of Segal AmeriCorps Education Awards earned by AmeriCorps members since 1994. For more information about AmeriCorps, visit http://www.americorps.gov/. Categories: News | Tags: AmeriCorps, Monroe County YMCA, volunteer | Permalink.